Beloved American hero Buzz Aldrin reflects on the wisdom, guiding principles, and irreverent anecdotes he’s gathered through his event-filled life – both in outer space and on earth. 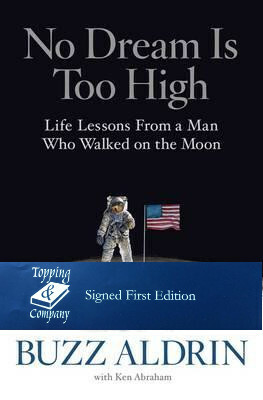 No Dream Is Too High whittles down Buzz Aldrin’s life into a short list of principles he values, each illustrated by fascinating anecdotes and memories, such as: Second comes right after first. NASA protocol should have meant he was first on the moon, but rules changed just before the mission. How he learned to be proud of being the second man on the moon. Look for opportunities, not obstacles. Buzz was rejected the first time he applied to be an astronaut. Failure is an opportunity to learn to do better. Always maintain your spirit of adventure. For his 80th birthday, Buzz went diving in the Galapagos and hitched a ride on a whale shark. He stays fit, energetic, and fascinated with life.